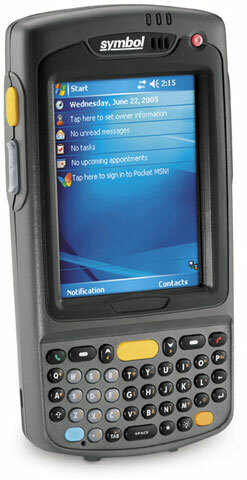 Symbol MC70 Complete Kit - Includes everything you need: MC70 terminal (Windows Mobile 5.0 OS with 64MB RAM/128MB ROM, WLAN/PAN, 802.11a/b/g and Bluetooth, QWERTY keypad, 1D scan engine, high capacity battery. Cradles, power supply and communication cables not included. See accessories. ), charging/communications cradle, USB cable, US power supply and AC line cord. The Symbol MC7090-PU0DJQFA8WR-KIT is also known as Symbol Technologies	MC7090-PU0DJQFA8WR-KIT	or MC7090PU0DJQFA8WRKIT	.